WHOA! Now this is both creepy and out of leftfield. Turbina, from Mexico City, have created in Leti’ Hum eek’ – Inda Jani – Mish Masadi (I don’t know what that means…) a piece of psychedelic rock worthy of a trip through Mictlan. ‘Cretino’ is a real suckerpunch of a track. With a shushed intro, slightly veering into Hooverphonic territory, a piercing scream cuts like a knife, letting the hard rock beasts break through, taking over the stereo. One hell of an opening track, sporting an acrid lyric like “from ignorane to cynicism / there’s only one step“. Indeed. Fantastic bass, almost overstaging the rest of the instruments (all doing a splendid job). There’s even a Mariachi scream somewhere there, but I’m still confused over what just happened. “What just happened?” is the question still spinning when the gloomy ‘La Noche’ starts. An ephemeral piano-led crescendo creates this atmosphere of dread, one that falls like a pea-soup fog in the darkest of the cold nights. An ethereal ambience takes over the minimalistic lyrics before exploding back into the crescendo, with a screeching guitar solo disappearing into the night with the song. Eerie. When ‘Predicador’ is halfways done, you perceive the band has a formula. A very complex formula that can only be explained by irrational numbers and polar mathematics. You might feel at home with what they do but then they do a freak out (saxophone included) just to break the pristine calmness that this lagoon of music mirrors. I’m afraid of ‘Todo lo que ves’. It feels and seems to be a ballad, an ubiquitous bugbear in all Mexican rock albums. The song ends and it seems everything is ok. No big surprises nor explosions. Wait, was that the twist? I’m still confused, but marching on this challenge. ‘Lamparas de Lava’ is a lovely track, slightly psychedelia inclined but still pop enough to be friendly and aesthetically pleasing. Before you think they’ve gone soft on us, there’s an instrumental break that gets a bit mystical machine gun. And with one fell swoop, we’re back in the strange path of experimentation. ‘Me ire’ could by all means be another romantic ballad like the previous two numbers, but no, it’s another slice of experimentation. A long ambient piece, quite abstract, works as a long segue to a bittersweet goodbye, which ends up, like burnt-up catharsis, leaving us again with that long, spacey atmosphere, lingering away. Lingering is just about right, as the atmosphere-heavy ‘Aire’ slowly dissolves this album away. A gorgeous 5 minutes of sonic atmospheres, mournful vocals and a powerful ending. Somewhere, a reviewer might listen to this and wonder how to catalogue this release. Is it alternative rock? Is it psychedelic rock? Is it rock en español? I say a bit of all, with some dreampop dashes to create a very pictoresque collection of tracks. 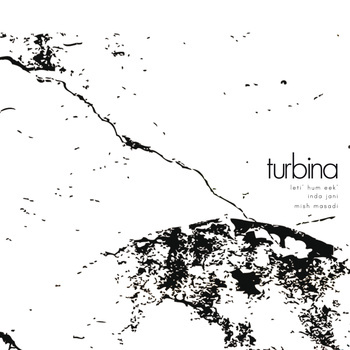 Well done, Turbina, keep it fresh. Words: Sam J. Valdes Lopez. Turbina Bandcamp. Twitter. Website. Facebook. Soundcloud. Posted in Proper Rock, Psychedelic, rant, reviewsTagged Leti' Hum eek' - Inda Jani - Mish Masadi, Mexico City, TurbinaBookmark the permalink. EP Round Up : Grassoline, Gunning For Tamar, Fashoda Crisis & Oh No! Yoko!